Presenting the First-Ever Published Reference On Performing in A Rock Band as a Singing Bassist. Have you recorded some of your own music and then thought, “How can I quickly and successfully assemble a Rock Band to Perform My Own Songs?” Or Maybe you will soon perform covers at a concert and you need to quickly assemble a band? Well, a Singing-Bassist can recruit band members much quicker and retain them more successfully, because he controls the groove and the vocals himself! 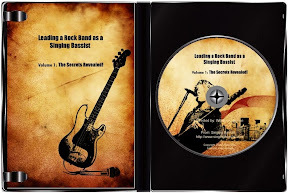 This DVD contains Exercises and Tips on how to hold down a groove and vocalize. 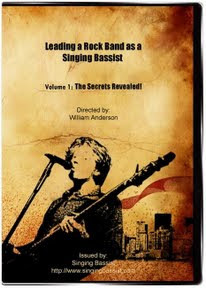 You will learn how to play your bass-guitar and sing, and impart your musical vision on band-members and spectators in the most direct way possible. The DVD is 79 minutes long and sells for only $35 incl. shipping, which is a small amount when you think of all the time saved by not having to recruit a separate singer or a bass-guitarist in order to form your band. You will be two band-members in one person as a Singing Bassist.